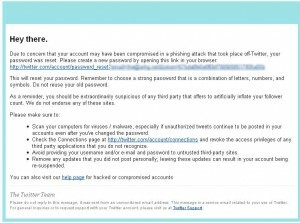 Right after we posted about Sophos study on the security risk posed by social networks, here comes a buzz regarding some Twitter users getting email from Twitter asking them to reset their passwords. 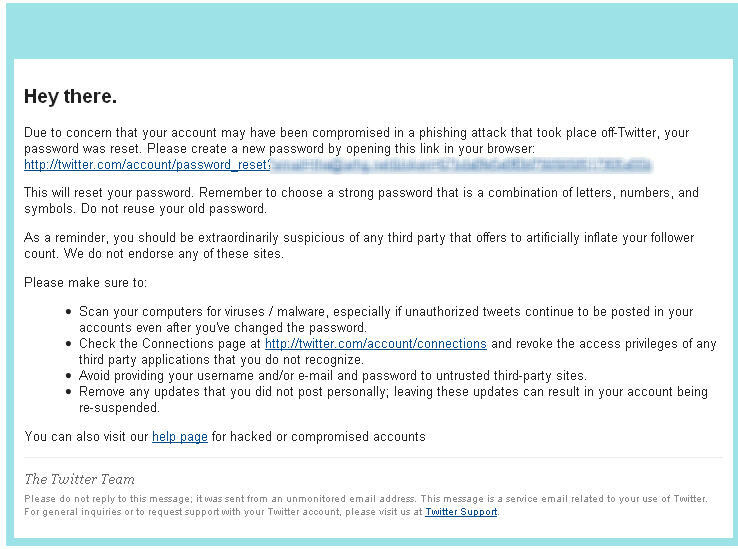 Thankfully, I’ve not received such email so I’m assuming that my Twitter account is safe, as of the moment. As part of Twitter’s ongoing security efforts, we reset passwords for a small number of accounts that we believe may have been compromised offsite. In one case, a number of accounts posted updates indicative of giving their username and password to untrusted third parties. While we’re still investigating and ensuring that the appropriate parties are notified, we do believe that the steps we’ve taken should ensure user safety. We’ll continue provide updates as warranted at @safety and @spam. We do, as always, encourage our users to read our help pages on what to do if your account is compromised: http://twitter.zendesk.com/forums/10713/entries/31796 and how to stay safe on Twitter: http://twitter.zendesk.com/forums/10711/entries/76036. So, there you go folks. That confirms that news of this new Twitter attack. If you didn’t get the email, there’s a slight chance that your account might still be attacked. So the best thing to do is to change you password anyway. I just did. Now, when will this ever stop really?